2002, 2003, 2004 and 2005 Ford Thunderbird Also, Accessories for you Clothing, jewelry, t-shirts, hats, embroidered and more. Highlight, copy, and paste unlinked websites. You may find even more companies for the products you're looking for by searching the net. Brake Pads - Ceramic - check your local parts deealers.&nnbsp; Napa carries ceramic pads for both the front and back brakes. Boot, Leather - crafted from original 2002 boot cover - vvisit ThunderbirdNest forum for information and pictures. Car Covers: (A word of advice ~ sun is the worst enemy to your car's paint AND to a car cover. Wind doesn't help either. If at all possible and you're worried about it, garage your car, protect it from dust, and pad the sides if you store it with other cars and DON'T store anything on top of it. Dot). Ceramic Brake Pads: check your local parts dealers. Napa carries ceramic pads for both the front and back brakes. 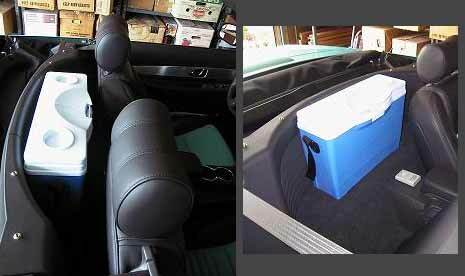 Cooler by Rubbermaid "The Slim cooler" #1801 ~ fits on shelf behind seats. Accessible from front seats. Find on ebay and Rubbermaid's website. see the TBN for compatible system. Most are using a Borla system right now as theirs is on the market. 2003 = 140081 - this system will fit the 2004 to 2005 though a slight modification of the heat shield may be needed. GPS ~ Global Positioning System - many stores carry these navigating units. Hardtop Tool ~ T40 Torx driver ~ available at most hardware stores, T-handle preferred but straight will work. ebay.com is a good source for used OEM Ford Workshop manuals ~ the manuals used by your Ford dealer's mechanics. 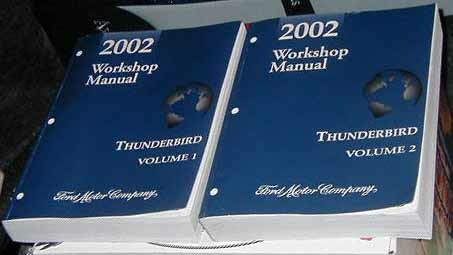 2002 ~ is a 2 book set of manuals; 2003-2005 each are one book manuals. There is also an electrical manual for each of the 4 years. Paint cover, clear ~ see: bra, front end nose covers above. http://arianiwheels.com/manufacturing.htm - Roadster/Zenith - ?? Dishes: Frankoma has a series of plates, mugs, & bowls with an Indian Thunderbird logo. Colors are mint green, teal green, black, merlot, and white. Can be found on ebay. Black is my favorite. www.mytbird.com : Turquoise or black faced watches from 2001. Check my collectible pages for what there may be on the market. This is not an endorsement of any companies listed above. They are listed here for your convenience.